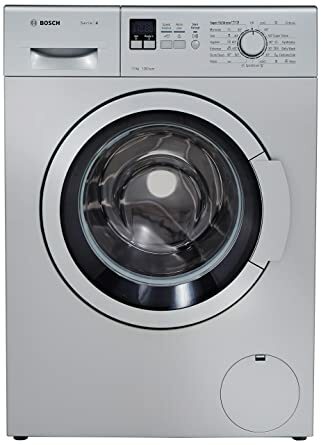 The price for Bosch 7 kg Fully Automatic Front Load Washing Machine ( WAK24168IN ) is valid across Bangalore, Hyderabad, Chennai, Mumbai, Delhi, Pune and Kolkata. The Bosch 7 kg Fully Automatic Front Load Washing Machine ( WAK24168IN ) is available at best price of INR 27901.2 on TatacliQ. Have bought this machine in may beginning, and after using this machine felt the buy is value for money and worth buying bosch. No sound at all. washes clothes cleanly, no stains of detergent. no tearing of the clothes as i was experiencing in my previous washing machine. The only issue i found is on the demo and installation process. didnt get the timely assistance from bosch. we waited for 5-6 days for the demo and installation. VIVEK's guys called me 2-3 times whether the demo is done or not. Rest everything is fantastic. loved the experience of using the machine myself when wife is not around. only effort which will consume your energy is to hang-drying the clothes. Its been 4 months that i have been looking for washing machine ,did lot of research and read plenty of reviews and finally decided to buy WAK 24168 BOSCH washing machine which has 1200RPM and &KG capacity which is enough for 4 people in the family.Let me tell you this has an amazing washing programs ( eg : it has hygienic washing program 24hrs extended wash etc) and trust me the washing quality is amazing,less noise ,minute shaking (may be because i am using machine stand)..Value for money ( i am sure you wont find 1200rpm,7kg front load in this price) and an excellent post sale service(installation and demo ). It is a excelent washing machine. This is my review after 2 weeks of usage It even cleans shirt collar better than hand wash Less noice Seriously amazed by this product.go for it. But don't buy this product in flikart.customer service is very bad. They made me wait 8 days for installation after delivery. I would give flikart 1/5 for it.